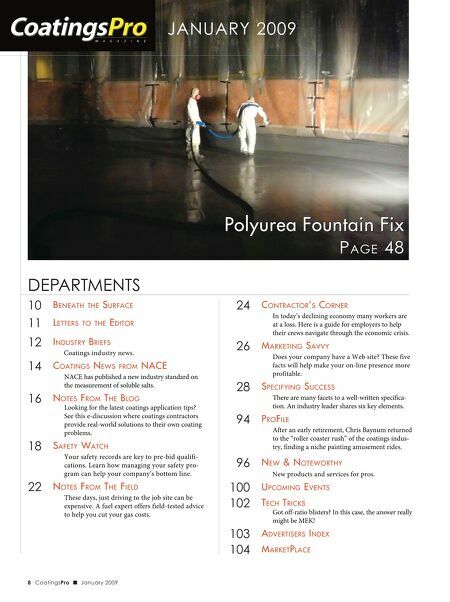 JANUARY 2009 Polyurea Fountain Fix PAGE 48 DEPARTMENTS 10 BENEATH THE SURFACE 11 LETTERS TO THE EDITOR 12 INDUSTRY BRIEFS Coatings industry news. 14 COATINGS NEWS FROM NACE NACE has published a new industry standard on the measurement of soluble salts. 16 NOTES FROM THE BLOG 18 SAFETY WATCH Your safety records are key to pre-bid qualifi- cations. Learn how managing your safety pro- gram can help your company's bottom line. 22 NOTES FROM THE FIELD These days, just driving to the job site can be expensive. A fuel expert offers field-tested advice to help you cut your gas costs. 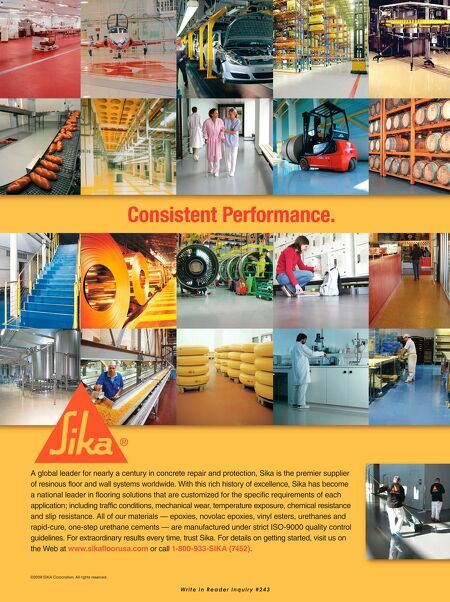 Looking for the latest coatings application tips? See this e-discussion where coatings contractors provide real-world solutions to their own coating problems. 24 CONTRACTOR'S CORNER In today's declining economy many workers are at a loss. Here is a guide for employers to help their crews navigate through the economic crisis. 26 MARKETING SAVVY Does your company have a Web site? These five facts will help make your on-line presence more profitable. 28 SPECIFYING SUCCESS There are many facets to a well-written specifica- tion. An industry leader shares six key elements. 94 PROFILE After an early retirement, Chris Baynum returned to the "roller coaster rush" of the coatings indus- try, finding a niche painting amusement rides. 96 NEW & NOTEWORTHY New products and services for pros. 100 UPCOMING EVENTS 102 TECH TRICKS 103 ADVERTISERS INDEX 104 MARKETPLACE 8 CoatingsPro J January 2009 Got off-ratio blisters? In this case, the answer really might be MEK!